My heart leaps. What could this exotic woodland gypsy possibly mean? 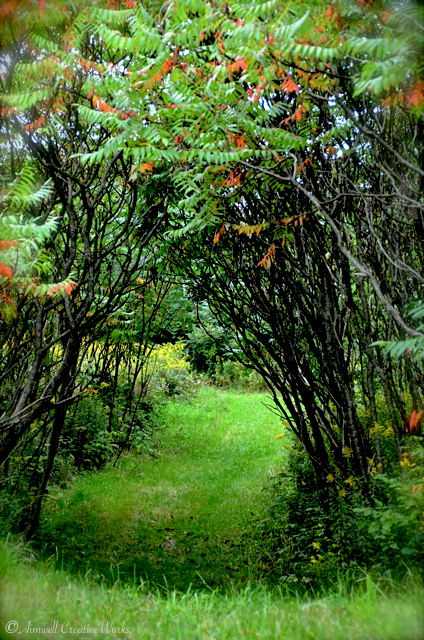 She doesn’t stop to explain, but continues her slow march through an archway of Sumac and into the thicket with the noble Chiron by her side. This twist in our encounter intrigues me. My power to resist squelched. Chiron has shot his golden arrow into my heart and hit a bullseye. I am hooked. Whatever medicine the Wounded Healer has to offer is worth my curiosity. The walk becomes a meditation. I don’t know where we are going. I lose all track of time becoming acutely and, perhaps, even primitively aware of my surroundings. Not in a fearful flight and fight way, but with a feeling of wonder. Shards of late afternoon sunlight flash warmly through the trees. Leaves and twigs crunch underfoot along the grassy trail leading I don’t know where. Squirrels scurry in the branches overhead while crows caw their eerie cries somewhere off in the distance. And still I follow deeper into the woods, the legion of maples and ash and pines standing sentry-like, protective and true. Finally, we enter a large circular clearing ~ a small meadow, perhaps ~ which appears almost as if carved out for a purpose. The gypsy and her noble companion stop in the centre of the circle and turn to face me. I stand my ground some 20 feet away. A shaft of light illuminates her countenance in an ethereal, angelic way I find astonishing. I sense empathy there. Tears well. I dam them. Chiron stands quietly beside her, his tail relaxed and brushing away the flies that dare to alight upon his muscled rump. He, too, is aglow with an energy which, though it comforts me I find difficult to comprehend. 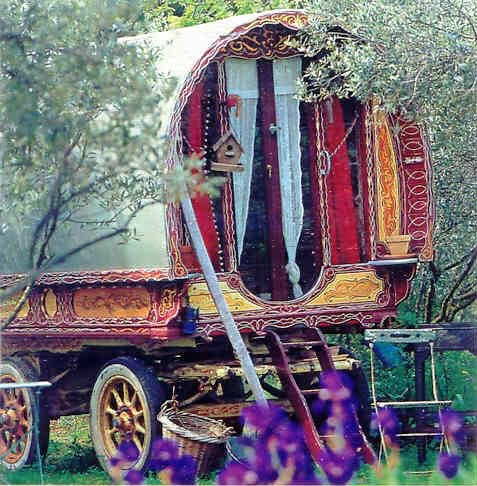 I feel a lump in my throat, and then hear the gypsy speak. I hesitate. Confused. Why is she talking to me as if we’ve never spoken before? She sees my confusion and responds. “Whose love? Whose truth?” I ask, confused. Erzebet looks at me quizzically. She smiles and nods her head gently in my direction to acknowledge our connection and steps away from Chiron toward the edge of the circle. For a moment confusion continues to reign. While the horse stands quietly but for the occasional toss of his head to disarm the flies my heart beats profoundly against my rib cage as though it might burst through. I gasp for breath. Erzebet stops a few feet away and begins to breathe in a way that compels me to follow her lead. Her intonation is that of a soothing chant. “In … through … your … nose … breathe … into … your … heart … release …” And as we proceed and after a few of these deep, clarifying breaths my body begins to fill with an unfamiliar warmth. My feet feel heavy and glued to Mother Earth. I am grounded. My eyes closed. Feeling. The notion of listening to my heart through my jaw seems strange at first. How is such a thing possible? With another deep breath I make the conscious effort to clear my head and focus on this tightness in my jaw. I am impatient, I can feel that too, but again, that is my mind getting in the way. Another breath, the prison of thought cleared, a moment of peace and then … dare I speak it? Chiron is close behind me now. I feel the warmth of his breath against the back of my neck, comforting somehow, as I exhale deeply. “I want to be able to speak freely and without judgement … that is self-judgement.” Tears mist my eyes. I choke them back. Not even these are free. You asked, I delivered … here is Part II of a free writing piece started last week courtesy of Kellie Elmore’s Free Write Friday. Yes, it seems there will be a Part III. Thanks for stopping by … and a sincere thank you to those of you who encouraged a next step in the story. I hope you have enjoyed it.